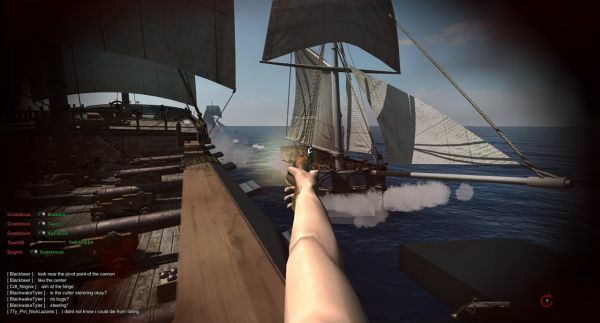 Blackwake is a multiplayer team based shooter centered around naval battles for PC and Mac. Set during the Age of Sail, Blackwake focuses largely on team based tactics and overall cooperation. Organizing a ship broadside, assisting your captain in navigating various weather conditions, or just being part of the gun crew – there are many roles to be filled in this shooter. Blackwake was created in August 2013 as a side project of Dakota’s. Development took a back seat until support began to grow and it was clear this was an idea worth risking. Tyler joined development in September after offering to help with art, and now does the majority of art assets for Blackwake. The goal of Blackwake is to make you feel as if the player is actually part of the crew rather than commanding AI or playing from an RTS perspective. The game aims to combine a strong crew experience with a strong sailing experience, bringing more layers of strategy to gameplay. Blackwake takes inspiration from Pirates of the Caribbean (the films), Pirate Ship Wars (Garry’s Mod) and even the old Battlefield Pirates mod. THQ Ice which was supposed to publish multiple titles has shut down after the closure of their first and only game, Dragonica Online. Ultima Online is over 20 years old. Let's just say that again and really give it some thought. Ultima Online is over 20 years old.